IPER Auditorium witnessed something unusual from the regular day. There were no lectures, competitions or award ceremonies that all altered to the offbeat get together. 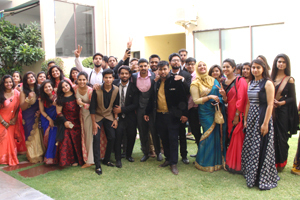 On this occasion, a farewell get-together was planned by the students of BCom, BBA, and other BCom specialization courses for their beloved seniors. The last day in college is a day that is celebrated with mixed emotions of joy, farewell excitement and low emotions as the college life is the most cherishing memory that every student reminisces forever. With such treasuring remembrance, the IPER family wishes the stepping out batch students all the best for their career and future endeavors! Watch out for the photo album on our Facebook page of IPER Bhopal.